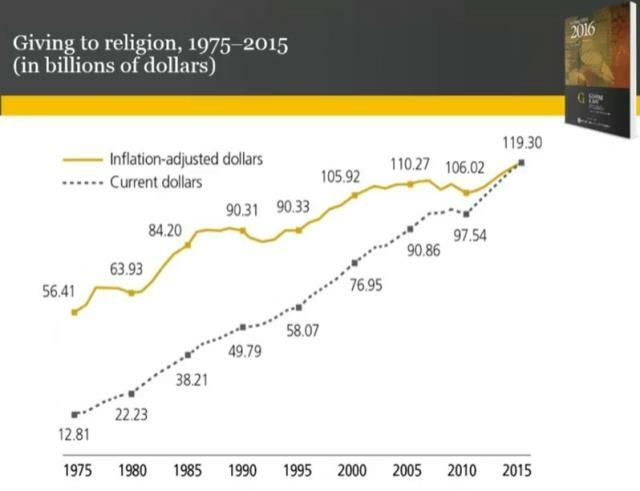 "2015 Was America's Most-Generous Year Ever." That's the headline from this year's Giving USA Report. And that's good news for the nonprofit sector. If you're not familiar with the Giving USA Report, it's the longest-running annual report on charitable giving. The report was researched and written by the Indiana University Lilly Family School of Philanthropy, and it's published by Giving USA. Here's what you need to know from this year's report, along with 15 fun facts about the numbers. FUN FACT #1: Charitable contributions reached a new all-time high in 2015. The total works out to Americans giving more than $1 billion to charity every day in 2015. More than $1 billion! Every day! FUN FACT #2: 2015 marked the sixth consecutive year of year-over-year giving increases. Experts attribute the increases to the country's improving economy. They also believe the increases are a sign that household income and personal finances are stabilizing. FUN FACT #6: Bequest giving depends on the 5 wealthiest estates that close each year. In some cases, this category can be influenced by a single mega-estate. FUN FACT #7: Corporate giving includes in-kind contributions and cash. In-kind donations, namely pharmaceuticals, make up a large percentage of corporate gifts. FUN FACT #8: Eight out of nine recipient types saw year-over-year increases in 2015. This is the same as last year - 8 out of 9 saw growth - although there was a change in the 2015 winner and loser. FUN FACT #9: International was the only subsector NOT to see growth in 2014, yet it realized the largest growth in donations in 2015 (+17.4%). This is attributed to the number of large scale, international incidents including the Nepal earthquake and the Syrian refugee crisis. FUN FACT: #10: Giving TO foundations was down in 2015 (-4.0%). This is attributed in part to the rise in popularity of donor-advised funds. Many donors find these funds less expensive to set-up and much easier to manage than a traditional foundation. FUN FACT #11: Three of the United States' top 10 "qualified public charities" are commercial donor-advised funds, according to the Philanthropy 400. FUN FACT #12: It's expected that the Fidelity Charitable Gift Fund will soon take over the top spot as the largest U.S. charity. Last year, Fidelity Charitable received only a fraction less (less than 1%) in private donations than United Way Worldwide. FUN FACT #15: There's a correlation between giving and volunteerism. People are more likely to give money to the same places where they give their time. 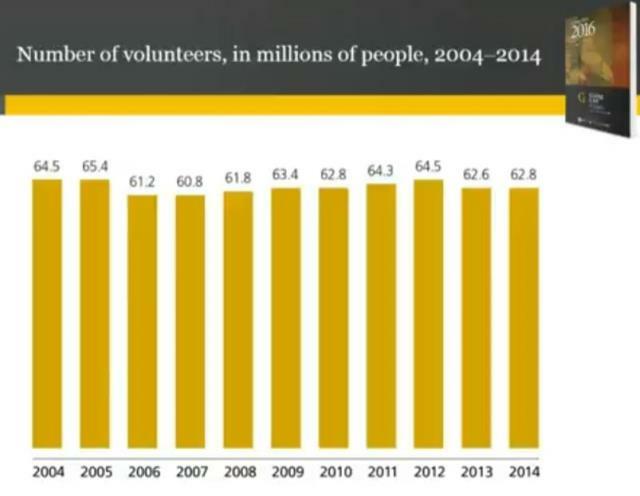 However, the number of volunteers has been flat and, in fact, has declined in recent years. Individuals continue to be the single largest source of charitable gifts, and we're beginning to see considerable growth from bequests. Gifts from individuals and estates are expected to continue to increase. But, remember: charitable gifts don't just happen - especially estate gifts. First, you need to develop meaningful relationships with donors. Educate them about your work. Get them involved. Ask them to volunteer. And yes, at some point, ask for a donation. Then, repeat the cycle. In Relationship Fundraising: A Donor-Based Approach to the Business of Raising Money, Ken Burnett reminds us that charitable contributions should be the result of your relationship with donors, not the reason for it. This post was inspired by the Spring 2016 issue of Advancing Philanthropy and the Giving USA 2016 report. Remember, there's more to grant writing than just "writing." Also remember, there's more to fundraising than just grants. Check out these charts, showing year-over-year changes and some 60-year trends. For a deeper dive (like giving as a % of GDP and how giving tracks with the S&P), read Bloomerang's top 5 takeaways. Use these tools to make the most from the latest Giving USA results. Send a message to start the conversation and learn how Laura can help you and your organization.